1.Summer Rain Private Estate are launching a promotion. 2.This promotion will run up to 14 October 2017, granted that guests have to register to attend the event to be entered into the lucky draw. 3. There will be prize draws from the pool of all the entrants which will be announced at the event to. To qualify for this prize candidates should be present at the event on 14 October 2017.
b. are able to provide the necessary FICA supporting documentation as required by law. a. Sign up for the database and complete the estate tour to enter, and be at the event to stand a chance to WIN. c. – Sign a sales contract to stand a chance to win your share of R10 000 in Game Stores vouchers. – Sign a rental contract and stand the chance to win your deposit. – Sign up to our database and tour the estate to Win A R2000 Riverside Mall voucher to qualify: you have to sign these contracts before 2pm on the day of the event, have all the required documentation as discussed with your agent, be present at the prize giving. It will be a random draw from entries and the winners will receive their prize upon registration of the property. 6. Prize winners will be selected by random draw. 8. During the contest period, you may be required to provide your personal details, such as Name, Surname and Email address. 9. Summer Rain Private Estate administrator’s decision is final and will be based on a random draw, which will take place at the event, given that the stipulated criteria was followed. 10. 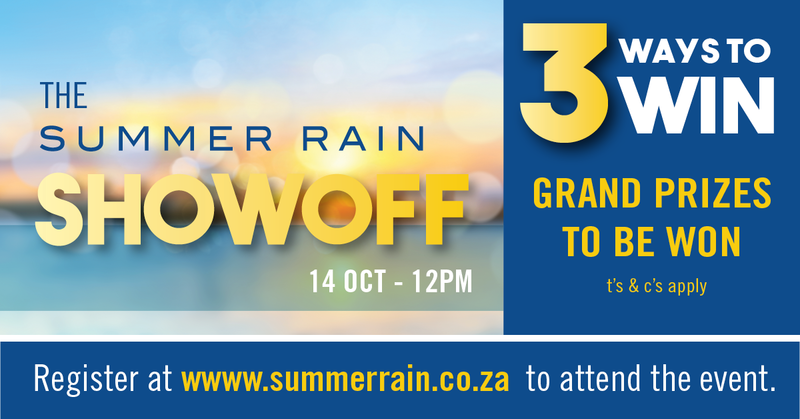 The organisers (Summer Rain Private Estate) of this competition will not contribute to any entrant for airfare, transport, accommodation cost or ANY other costs of ANY entrants wanting to attend the launch event in Nelspruit. 11. The prizes are set and CANNOT be exchanged for cash. 12. The prizes are not transferable or refundable. Summer Rain Private Estate retains the right to publicise the winners’ names and photos across all marketing material, without having to pay them for using their picture in the communication after and during the event. 13. No employees or direct family members of employees (such as brother, sister, mother, father, child, husband, wife) may partake in the promotion to win prizes. 14. Summer Rain Private Estate management reserves the right to amend or withdraw the promotion in the event of any unforeseen circumstances outside their reasonable control. 15. Summer Rain Private Estate accepts no responsibility for difficulties experienced in submitting an entry to this . Late entries cannot be taken into account after the closing date due to technical difficulties. 17. This promotion is in no way sponsored, endorsed or administered by, or associated with, Facebook. You are providing your information to Summer Rain Private Estate and not to Facebook. The information you provide will only be used for email marketing purposes and not shared with any third parties. 18. Entrants are deemed to accept these terms and conditions by entering the competition.